← Are the Hunters Good or Bad for Rugby League in PNG? Why isn’t High School Sport Bigger than Texas in Australia? 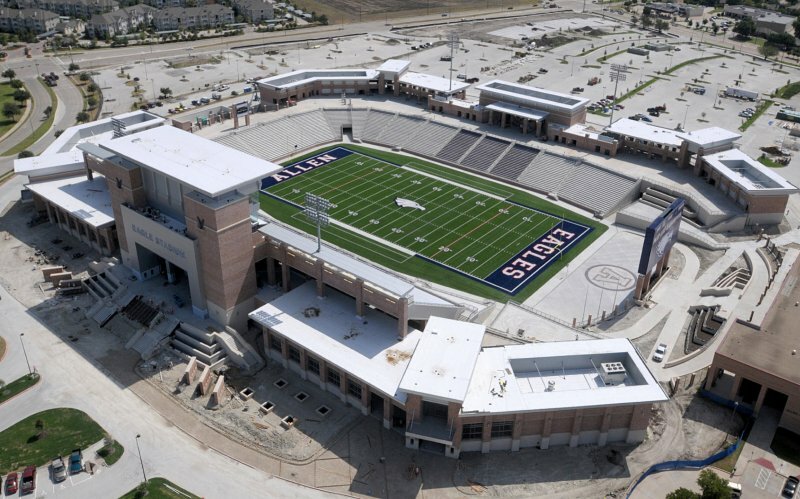 in 2012, a high school in Allen, Texas built a $60M 18,000 seat stadium for football. College sport is even bigger than high school sport. For instance, many of the matches in multiple sports are televised and ESPNU is a channel completely dedicated to college sport. Despite being amateur (allegedly at least), college sport is a billion dollar industry. The team which best illustrates the importance of college sport to the U.S psyche is the Nebraska Cornhuskers American Football side which has sold out Memorial Stadium in Lincoln, Nebraska (population 265,404 (2012)) with a capacity of around 85,000 since 1962. Unbelievable. So why is high school sport and university sport so anonymous in Australia compared to the U.S? With the exception of first XV rugby in Sydney and Brisbane (and I’m sure there is some equivalent high profile Australian Rules Football played in high schools in the southern states as well), high school sport seems quite minor in comparison to the U.S. Now I’m not saying that Australians don’t love high school sport (for instance, the GIO Schoolboy cup in Rugby League is televised by channel 9) but the crowds, the press coverage, the internet copy given to U.S high school sport walks all over the Australian take on the matter. Here are some theories. You may have some of your own. Australia and the U.S have a different view of what high school actually is. For Australians high school is an education focussed means to an end. America seems to view high school in a very different manner. For some Americans it seems to be a high point for their life. Australia does not seem as universally focussed on high school loyalties especially after the event. In Australia some private school alumni contribute to their school community long after they have ceased to go to school. Most other Australians have little contact with their old high school. This is in stark contrast to the American booster system of financial and moral support for high school sports and colleges. We just don’t care as much about it. As a result Americans seem to overly romanticise high school as well. I think it is one of the reasons that they cast adults in their high school dramas instead of kids (some have said the main reason is child labour laws in the U.S). U.S high schools are also a feeder system for colleges which in turn are a feeder system for professional sports. It’s not so much the case over here. We feed professional sport in a different way, often through club sports as well. Universities in Australia do not recruit anywhere near the volume of sports stars that the U.S recruits and athletes in Australian universities predominantly are there to get an education. Their athletic careers are fairly unrelated to their education. This is clearly not the case in the U.S. In the U.S, the whole nation plays the same sports (eg. Baseball, American Football, Basketball and Ice Hockey). In Australia, Cricket and AFL are really the only national sports, and even then, there’s no state Cricket team from the Northern Territory or the Australian Capital Territory and no AFL team from NT, ACT or Tasmania. The different states of Australia don’t speak the same sports language. Americans seem to allow more time for their high school sport in terms of practices and game related activities. Australian schools do not prioritise sport in quite the same manner. A couple of hours on a Wednesday arvo doesn’t seem to generate much enthusiasm. America has way more people (313.9 million) compared to Australia (22.68 million). Sometimes we just don’t have the people to support such crowds. Their population is fairly homogenously spread across the states as opposed to a population predominantly on the coast. Historically they have more money to spend (U.S GDP – 15.68 trillion USD in 2012) compared to (Australian GDP – 1.51 trillion USD in 2012). And they created the internet so there’s that. All of which does not really explain why they love high school sport more than us. I think primarily our culture’s are different. I expect it will take a sociologist to explain why. The effort shown by the Broncos and the Eels – fighting to the very end. The combination between Luke Brooks and James Tedesco. Very Cooper Cronk and Billy Slater. Semi Radradra. The man mountain was almost Lomuesque on the weekend. A very impressive start to his young career. The Storm grinding out another win. They just turn up every week ready to play. The Bunnies pack. Just out enthused and out muscled on Friday night. The loss of Isaac Luke will not help things. The ‘dominate or at least unsettle the Burgess boys and win the match’ strategy isn’t a good sign either, for the Bunnies that is. The Cowboys. Two narrow losses a season does not make but fans are nervous. Manly looked like they were cruising all afternoon and were lucky to survive. Football commentators keep pumping for the abolition of the scrum. While I can see the arguments for removing the scrum from the game (almost certain result and time consuming) I think the arguments for keeping the scrum are stronger (provides a different attacking opportunity with limited defence). Plus I was involved in a junior trial a thousand years ago which replaced all scrums with a penalty instead and it was the most boring game I ever played. It was exactly like touch football with tackling. They should rename the Broncos as the Brisbane Backrowers. Not only do they have 4 international players who could play in the second row or lock positions, but a large percentage of the squad could play in the back three positions in the scrum at a pinch (Daniel Vidot, Jack Reed, Dale Copley, Corey Parker, Sam Thaiday, Alex Glenn, Matt Gillett, Todd Lowrie, Jarrod Wallace and Corey Oates, almost 60% of the team). The Titans are winning away but losing at home. Strange. Conversely, they are losing during the day and winning at night which is more understandable given the size of their pack. Although I wouldn’t have been eligible for Warren Buffet’s $1 Billion challenge (open to U.S residents only) it wouldn’t have mattered anyway as my bracket was pretty much busted within hours of the NCAA tournament kicking off. The Arizona State University Sun Devils did me in for the record. Ben Hunt – Run Metres – 80m, Line Breaks – 3, Line Break Assists – 1, Tries – 2, Try Assists – 2, Tackle Breaks – 8, Tackles – 10, Missed Tackles – 0, Errors – 2 and Minimum weeks that the Broncos won’t hear journalists complaining about their halves – 1. Why is American high school sport a bigger deal than Australian high school sport? This entry was tagged American Football, Australia, College, Friday Night Lights, General Sports, High School, NRL, Rugby League, United States. Bookmark the permalink.